Using a car lease to obtain a vehicle is a very common practice in the auto industry today. Many car buyers are finding that it makes more sense for them financially to lease a car instead of buying one. With the lower payments, no maintenance costs, and the opportunity to drive new cars, it is easy to see what lures many into leasing a car. While it can be pretty attractive, sometimes the lease is actually too much for many to handle. They think that they can handle the lease payments, but when it comes down to it, it is simply too much. Therefore, many of those that sign up for leases find themselves in the precarious position of defaulting on the agreement. Defaulting on a car lease carries with it a few serious repercussions. Here are a few consequences of defaulting on a car lease and why you should avoid it if at all possible. The most immediate consequence is that the dealer will come and take your car away. The dealer technically still owns the car and is just leasing it to you. Therefore, if you fail to make the payments on your lease, they can take back their property. This is the same principal as a tenant that does not pay their rent getting evicted. You have to make the payments on time, or else the car is as good as gone. If you lose your car, your financial woes could be just getting started. Most people rely on their car as a means to get to and from work. If you cannot get to work, you cannot work. Therefore, you may have problems paying other bills later on as well. Even if you do find a way to get to and from work, it will likely be much less convenient than what you are used to. Defaulting on any loan looks really bad on your credit history. Defaulting on your car loan will have the effect of lowering your credit score significantly. The credit bureaus do not take a default lightly. This means that they could lower your score significantly for the short-term. It will take a lot of work on your part to get the score back up to a respectable level. 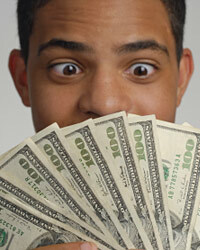 Once your credit score is lowered, you will have a very difficult time making large purchases in the future. You will not be able to get a loan for anything from a mortgage to a personal loan. You definitely will not be able to get a regular car loan under the circumstances. Therefore, it will not only affect you in the short-term, but in the long-term as well. Until you build your score back up, you will have a hard time getting approved for any financing of any kind. You will have to deal on an all-cash basis for the foreseeable future.